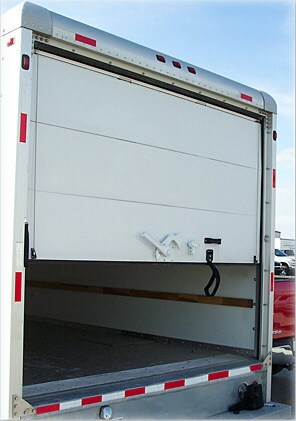 Box truck roll up doors experience some of the heaviest wear and tear of any commercial doors on the market. Unlike the roll up doors in warehouses or delivery bays – that often remain open or closed for long periods of time – box truck roll up doors are used continuously through the day. Plus, they’re prone to continuous vibrations caused by a life on the road. Truck doors are opened and closed with every delivery they make, and are prone to the banging and clanging of whatever objects pass their way. They may have an occasional ding here and there from having been “backed up” for just a second or two longer than necessary – and then there is the threat of vandalism, which adds another host of paint coats, intentional dents and other damage to the mix. Regular maintenance is the key to increasing the lifespan of your box truck roll up doors. By giving them the once over on a regular basis, and then scheduling them for professional maintenance every year or six-months, you’ll find your repair and/or replacement bills will decrease from year to year. Here are some of the things you can do to keep your truck’s roll up doors operating smoothly and efficiently on a daily basis. Keep it clean. The more you can keep your rolling door, it’s tracks and the mechanical parts free of dust and debris, the smoother and more consistently they will work. Make it a practice to keep the area around the door clean, and sweep it regularly to prevent dust, leaves, twigs and cardboard/plastic/wrapper scraps and other small items out of the bed of your truck. Never force it. A well-maintained rolling truck door should not require excessive force to open or close. If it does, it’s a sign that something needs to be looked at ASAP. If you continue to force a “tricky door”, you risk increasing the severity of the existing damage, which can increase the total costs for repair. You also put yourself, customers and other employees at risk for injury. Keep mechanical parts lubricated. The hinges and rollers must be greased, or lubricated, to work as they were designed. This helps to free them of inescapable dust and airborne particulates and also protects them from moisture and the elements. Refer to the manufacturer’s guidelines regarding how often to grease the rollers and hinges, as well as to verify which products are recommended. Failure to follow the manufacturer’s recommendations could cause you to void the warranty. Bring it in for a check-up. Rolling door installers are happy to provide regular “check ups,” giving your truck’s doors the once-over. Consider scheduling a service appointment every six months or so. Combine it with maintenance inspections for your fire doors, other commercial doors and/or loading dock area so you don’t forget. The maintenance company will be happy to calendar these visits for you so you don’t have to remember. Regular maintenance is the best way to prevent smaller, insignificant adjustments or repairs from becoming larger and more expensive versions. Repair or replace a door if there are obvious signs of a problem. For a small and medium-sized business, the bottom line is pretty darn thin. Even so, holding off on a necessary repair or replacement part can wind up costing you way more if the door gives out at an inopportune time or – worse – winds up injuring a worker or customer. Always call rolling door repair company at the first sign of trouble. Is one of your fleet’s rolling doors giving you trouble? Contact us here at R&S so we can take a look. We’re happy to replace broken springs, cables, sections, and other box truck rolling door parts to help keep your truck on the road. (925) 671-7606. Previous Post: Stretching Your Garage Space to the MaxNext Post: Detached or Attached Garage? Which is Safer?